Experience the new standard in practice guides. 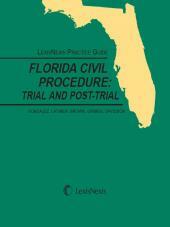 LexisNexis Practice Guide: Florida Trial and Post-Trial combines lucid legal analysis of Florida law and procedure with step-by-step guidance essential to effectively manage every critical step in the trial and post-trial process. Experience the new standard in practice guides. The LexisNexis Practice Guide on Florida Civil Procedure : Trial and Post-trial is part of a 5-volume series that gives you step-by-step guidance on procedural issues and quickly points you to LexisNexis resources that help you build your case. With its concise writing style, streamlined chapter format, abundance of checklists and forms, thousands of references to leading and related cases, cross references to relevant analytical content, and extensive and authoritative guidance from a consultative board of experienced Florida practitioners and judges, youll find more of everything that makes a practice guide valuable and easy for you to use.